Shop the latest musthave trousers! Keep on trend with our new season collection with our offering of trend lead women’s trousers for all occasions. From flattering high waisted styles to cropped trousers. Whatever your plans, we’ve got the trousers to fit! Flares have made a comeback and are here to stay. Featuring a super soft black material and figure-skimming fit, style with a neon green top and white sneakers for a casual style we're obsessed with! Flares have made a comeback and are here to stay. Featuring a camel material and figure-skimming fit with an elasticated waist, style with a cute top and heels for a casual style we're obsessed with! 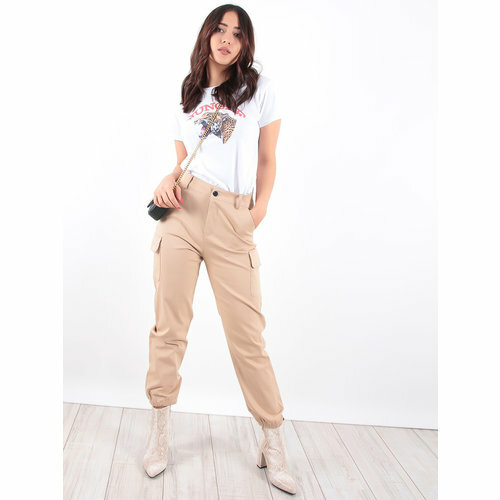 Update your everyday wardrobe with these cargo trousers. Featuring a camel material and pocket detail on the front, style them with a crop top and heels or dress them down with a sweater and kicks. Give your weekend wardrobe an update with these wide leg bottoms. Featuring a black sheer lace material with a wide leg fit, team it witha cute top and heels for a night out with the dolls. Give your weekend wardrobe an update with these wide leg bottoms. Featuring a white sheer lace material with a wide leg fit, team it witha cute top and heels for a night out with the dolls. Update your everyday wardrobe with these cargo trousers. Featuring a white material and pocket detail on the front, style them with a crop top and heels or dress them down with a sweater and kicks. Give your off-duty look a serious update with these trousers. Featuring a beige suede material with a flattering high waistline and a straight leg fit. Team this with a slogan tee and fresh kicks to complete the look! Take your look to a whole new level in these trousers. Featuring a black pu material with an elasticated waistband and front zip. Team these with a cute top and strappy heels for drinks with the girls! Sometimes you just wanna chill and look cute at the same time.. this gorgeous camel colour loungewear set is the perfect pick for those lounging days. Sometimes you just wanna chill and look cute at the same time.. this gorgeous grey colour loungewear set is the perfect pick for those lounging days. These joggers are essential for those chilled lounging days. Team these joggers with a logo tee and a pair of fresh sneakers to finish off the look! Give your OOTD an update. Featuring a neon lime mesh fabric, wide leg fit and an elasticated waistband. We love this styled with the matching crop top and black heels for an oh-so-extra style. We are in love with this super cute co-ord ribbed knit detail set! Featuring a comfy loose fit with a wide leg and long sleeves in a classic black colour. You can't go wrong! This comfy set is perfect for giving your everyday look a standout vibe. Featuring a neon lime material with drawstring pants and a matching cropped hoodie and stripe detail, style with some white kicks for a look we are loving! Add some prints to your look with these trousers. Featuring a snake print material with an elasticated waistband and a flared fit. Team this with this a bodysuit or bright neon top and strappy heels for a look we are loving! We are obsessing over all things rib right now and these trousers are a serious off-duty musthave! Featuring a black rib fabric with a loose, wide leg fit, you can't go wrong. Team with matching black crop top and heels for a killer look. Get all heads turning with these boujee trousers. Featuring a beige slinky material with all over leopard print, contrast side stripe detail in a straight leg style, team it with a simple tee and matching jacket for a weekend worthy look! Take your look to a whole new level in these trousers. Featuring a black pu material with an elasticated waistband and a cropped length. Team these with a cute top and strappy heels for a night out with the girls! We are loving prints this season and these wide-leg trousers are everything we are loving. Featuring a grey snake print material with an elasticated waistband and a wide-leg fit. Team these trousers with strappy heels to complete the look. Amp up your outfit with these animal print trousers. Featuring a snake print material with a tapered fit, what's not to love? Team this with a simple top and the matching blazer for a look that will have all eyes on you! Give your off-duty look a serious update with these trousers. 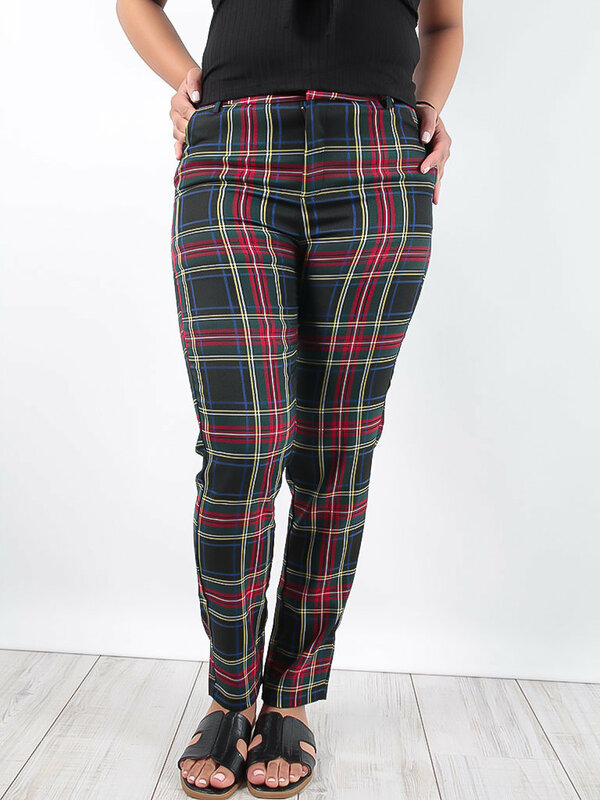 Featuring a black check print material with a flattering high waistline and a straight leg fit. Team this with a slogan tee and fresh kicks to complete the look. Keep on trend with our new season collection with our offering of trend leading women’s trousers for all occasions. From fits in figure flattering high waisted styles to cropped trousers. Whatever your plans, we’ve got the trousers to fit!